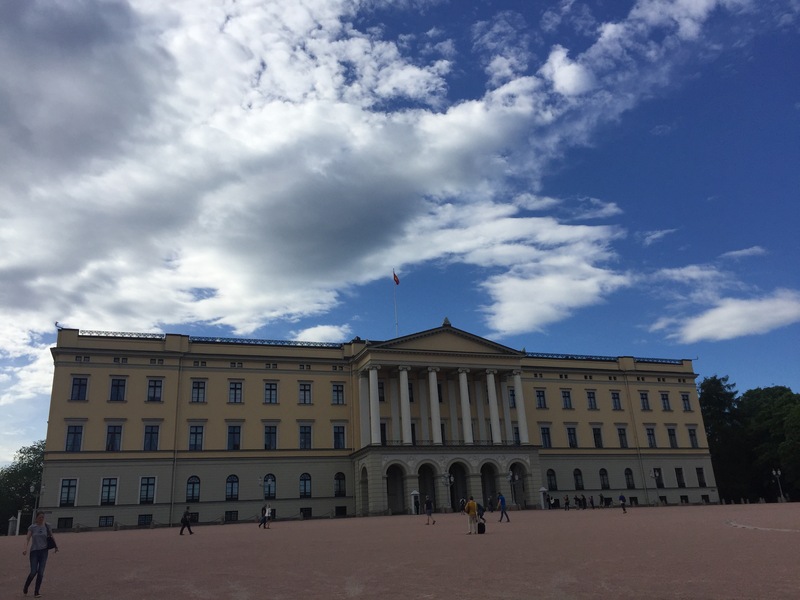 My walking tour around Oslo included stops at an old hilltop fortress (excellent views of Oslo’s harbor), the Nobel Peace Center (a museum worth a visit but assuredly either boring or inappropriate for young children, depending on its temporary exhibit topics), and the Royal Palace (I have seen stoic guards in palaces around Europe, and those posted here are just as neat as the others). I was hoping for a visit to the Viking Ship Museum and the Edward Munch art museum, but those items will have to await another visit. The Nobel Peace Center had a touching display on the ground floor focused on refugees from Syria’s 5+ year civil war and a profoundly interesting exhibit on the first floor that documented the most recent Nobel laureate’s work to promote peace between the Colombian government/people and the FARC revolutionary forces. So many political, economic, and demographic forces have come together to magnify generations of violence and violent reprisals… oh, and cocaine. It’s the only viable cash crop, according to the (biased?) cocaine producers in Columbia. No surprise, as I’m sure other viable crops have by this point been selected out of production and dropped out of the marketplace almost entirely. But the revolution isn’t about cocaine – that’s just an interesting side story. The revolution has been between what had been right-wing government and left-wing revolutionaries in the 60s and 70s carried through to the 2010s. A little piece of the American-USSR Cold War that didn’t end with the end of that conflict… Funny how the wars we pay for or begin ourselves sometimes outlast our interest in those wars. In any case, the president of Columbia, Juan Manuel Santos has managed to tow the line between right- and left-wing politics, emphasizing help for the poorest Colombians and the peace process with FARC banditos and revolutionaries. He’s quite a character and the recipient of the 2016 Peace Prize. The exhibit on his efforts included photographic and video presentations and is worth seeing. The trouble is that on the first day or two of a long trip to Europe, I’m not exactly at the top of my travel game. I slept 17 hours after holding back as long as I could (I slept less than an hour on the redeye over from JFK airport) and then found myself awake until 5am on night two. The unexpected bonus was an interesting experience: the sun set, I suppose, but it never got very dark. I don’t mind visiting a place only to miss out on key objectives: this only provides reasons to add to my list supporting a return visit. Norway is one of those places (also on the list: Brussels, Wurzburg). 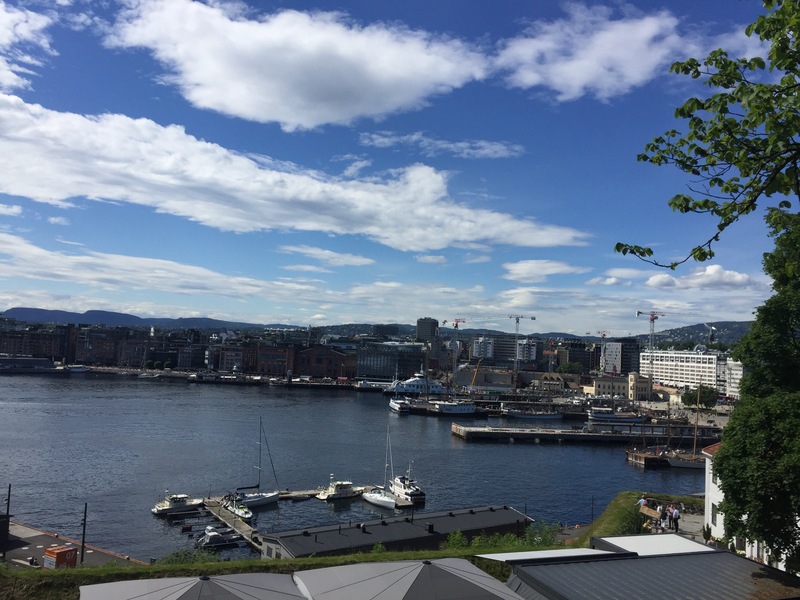 This entry was posted in Travelogue, Travelogue 2017, Travels and tagged cold war, FARC, juan manuel santos, Nobel Peace Center, nobel peace prize, nobel prize, norway, oslo, Oslo Sights, peace prize, travel, traveling, travels. Bookmark the permalink.